Last Friday Duke lost to Maryland in the ACC tourney quarterfinals, but still earned an at-large bid to this week’s NCAA tournament. The Blue Devils were stunned by #15-seed Lehigh in the 2012 NCAA tourney, but bounced back in 2013 to claim the school’s 18th straight NCAA tourney bid. 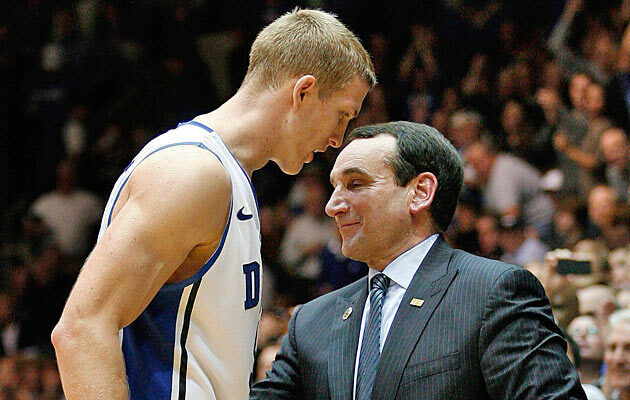 Earlier today Jon Teitel got to speak with Mason Plumlee about what it feels like to play for the winningest coach in college basketball history. You played 9 minutes in the 2010 NCAA tourney final (a 2-PT win over Butler): what did it mean to you to win the title, and what is the key to winning games in March? The key is to just be mentally tough: when the game is on the line, you have to come together to execute and make stops. Ryan Kelly missed last year’s NCAA tourney and 13 games this year due to injuries: how crucial is he to your team’s success in the NCAA tourney? Our record with and without him shows his value to the team. You always want to have a senior who has been in big-game situations when you enter the tourney. You have beaten a ton of tourney teams this season (Florida Gulf Coast/Minnesota/VCU/Louisville/Ohio State/Temple/Davidson/NC State/North Carolina/Miami): which of them impressed you the most? I would say Ohio State and Louisville really impressed me, as well as Miami. They all have a chance to make a deep run. You are one of a handful of players who averaged a double-double this season: how do you balance your scoring with your rebounding? They really go hand-in-hand, especially if you can get to the offensive boards. If you are aggressive when going after rebounds, then the points will come easier. You are a two-time Academic All-American: how much importance do you place on academics? It is a big part of it. The people are in place here to help you if you are willing to put the time in to accomplish academic accolades. Hall of Fame coach Mike Krzyzewski is the winningest coach in NCAA history: what makes him such a great coach, and what is the most important thing you ever learned from him? I learned to have discipline and hunger on a daily basis. He does not prepare for an exhibition game any different from the way he prepares for a Final Four game. Your older brother Miles plays for the Pacers, your younger brother Marshall is one of your current teammates, and your father Perky, mother Leslie, grandfather Albert and uncles William and Chad all played basketball: who is the best player in the family, and do you credit at least some of your success to genetics? I would say that I am the best in the family. My dad had the biggest influence on me, we watched games when I was really young and we would talk about different players. He would always come to my own games and give me feedback. You play Albany on Friday in Philly: what do you know about the Great Danes, and after last year is it safe to say that you will not be looking past the #15-seed? I know that they are a hot team, as is any team that wins their conference tourney. They have a really good guard in Mike Black, and the kid from Australia who plays inside (Sam Rowley) is also good.